Johnny Depp frequently refers to his life and career as "the ride." Like most Hollywood actors, his journey has been something of a roller coaster, and right now, he couldn't be higher off the ground. Depp admits even his mother, Betty Sue, was impressed when he landed on a recent cover of Newsweek and his star power drew comparisons between him and Tom Cruise. "He's a pretty buff young man, Tom Cruise," said Depp in LA, grinning from under a gray hat. "I haven't physically grown so I don't think I'm any bigger than him." But while Cruise, 44 on July 3, routinely tops lists as Hollywood's most powerful and bankable star, it's 43-year-old Depp who has the acting credibility and reputation for uncanny choices of material. Even his move into popcorn movies three years ago with Pirates of the Caribbean earned him the first of back-to-back Golden Globe and Oscar nominations as Best Actor. That's led to two sequels—Dead Man's Chest and a third, as-yet-untitled installment due out in May. And, while Cruise's personal life has taken intriguing turns of late, Depp, who had some wild days early in his career, is now the epitome of a happy family man, father of Lily-Rose, 7, and four-year-old Jack with his long-term partner, French singer and actor Vanessa Paradis. "Even before the ride took this particular turn (with Pirates), I never really went out much, so nothing has changed in that regard," he said. "My kids have a super-normal life. They do their school and they play with their friends. "Okay, they get to go to Disneyland maybe a little more often than other kids, but that's part of the gig. "The family is miraculous. I mean, it just couldn't be better. "Everything I've wanted out of life I've got it—my kids, my girl. I'm happy about the work." Depp and his family divide their time between homes in LA and the south of France and, having spent more than two years in The Bahamas making the three Pirates movies and earning about $47.8 million for the sequels, he has also bought a small island about 100km south of Nassau. The retreat has become "a very necessary part of the balance." "Here in Hollywood, with this work, that's one type of animal. The island and the idea of going to a place where there are no telephones, no cars, no street lights or noises—there's just nature and the sea and the wind and the sun—that brings things down to their absolute base level," he said. "It's a great education for the kids. It serves a lot of purposes and it's good to get away, definitely." Depp, who has always spoken openly about Paradis and their children, says being the father of a seven-year-old and a four-year-old is "a high-energy, high-stakes experience." "My daughter now is exiting that Barbie stage and moving into fashion accessories, real teenage stuff, which is unbelievable for me to have to witness," he said. "Now she wants to watch big girl television. It's frightening. "My boy, Jack, is still a blessing. He's discovered superheroes now, which is fun, and he's going into the area of comic books, and I happen to be pretty good in that area. "Vanessa and I have been lucky to have spent so much time with our kids, but we're also lucky enough to take time for ourselves, because you've got to remain not only lovers and all that stuff, but friends. It can't always be talking about the kids." Occasionally Depp and Paradis, 33, work at the same time. While he shot The Libertine, also due out next month, she starred in French film Mon Ange (My Angel) and has been writing songs for an album she is recording now. "A couple of tracks are hard to listen to because you just get all weepy-eyed," Depp said. "It's an album she should be very proud of. "The good news about her work is that while mine has tended to be location-driven, she can still play, she can still write, she can still do demos wherever we are. "Then she'll fly off to France for a couple of weeks and then come back." Depp said his toughest time in their relationship came about five years ago, when Paradis embarked on a concert tour. "We didn't have a nanny, so I was the tour daddy," he said, grinning again. "We traveled by bus and watched The Wizard of Oz for the 7000th time and, while Vanessa was doing her work—you know, rehearsals, going on stage, meeting and greeting and all that—I was just being poppa and I had the distinct impression my daughter wanted to spend more time with Vanessa. It was kind of a challenge and a hurdle as a dad, but it was a great education and I got through it and so did she." Once a deal was done for Depp to reprise his rakish Captain Jack Sparrow—he doesn't understand Hollywood deal-making and leaves it to "the adults"—he easily slipped back into the character he originally based on a cross between Rolling Stone Keith Richards and Pepe Le Pew. 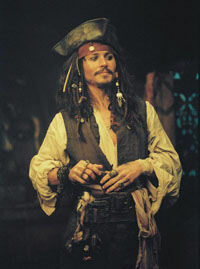 "I've been asked whether I watched Pirates 1 to get the sense of Captain Jack again and I didn't," he said. "I avoided it. It was very simply just a case of strapping back into the costume again and stepping on set and seeing all the familiar faces. It felt like we'd had a week's break and just started shooting again." Orlando Bloom (Will Turner), Keira Knightley (Elizabeth Swann), Jack Davenport (James Norrington) and many of the cast from the first film return for Dead Man's Chest, in which Jack runs afoul of lord of the deep Davy Jones and his sea-phantoms. The most notable additions are: Bill Nighy (Love Actually, Underworld) as Davy Jones; Stellan Skarsgard (King Arthur) as Bootstrap Bill Turner, long-lost father of Will; and Naomie Harris (soon to be seen in Miami Vice) as Caribbean soothsayer Tia Dalma. "The thing we always talked about was the second and the third films have to stand on their own, although making sense in terms of a trilogy at the same time," Depp said. "That's no small feat for those writers (Ted Elliott, Terry Rossio) and for Gore (Verbinski), the director, and I think they've achieved it."